Explore the area around Maryhill with our exclusive 36 Hours in the Gorge itinerary. In it you’ll find the inside scoop on where to nosh, where to hang your hat and which fascinating sites to visit on your next trip to Maryhill. This is the first in a series that will include itineraries specially designed for families, outdoor enthusiasts, foodies and more. 11 a.m. Amble west to Maryhill Museum of Art, enjoy lunch on the patio at Loïe’s. 2 p.m. Time to imbibe at nearby Maryhill Winery or make this the start of a wine tasting tour consisting of stops at Cascade Cliffs, Marshal’s and Waving Tree wineries. 6 p.m. Supper at the saloon: Baldwin Saloon, in The Dalles, Oregon serves a complete menu featuring steaks, seafood, pasta, salads and homey desserts. After dinner, stroll through The Dalles and enjoy the colorful murals depicting such historical themes as Lewis and Clark exploration and life at the end of the Oregon Trail. 10 a.m. Explore Gorge geology at the Columbia Gorge Discovery Center in The Dalles. 1 p.m. Enjoy a late lunch at Celilo in Hood River, Oregon, offering a menu featuring fresh, local ingredients. Save time to explore galleries and shops in Hood River, including the Columbia Art Gallery and Made in the Gorge. Before hitting the road, fuel up with a frothy cappuccino from Doppio Coffee + Lounge. 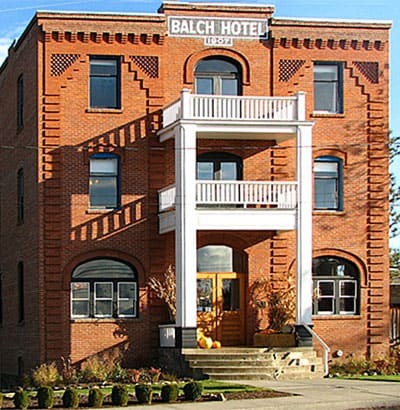 The Balch Hotel is a historic commercial lodging building in Dufur, Oregon, 15 miles south of The Dalles, and approximately 40 minutes from Maryhill Museum of Art. It was built in 1907 by Charles Balch, a local land owner and businessman. 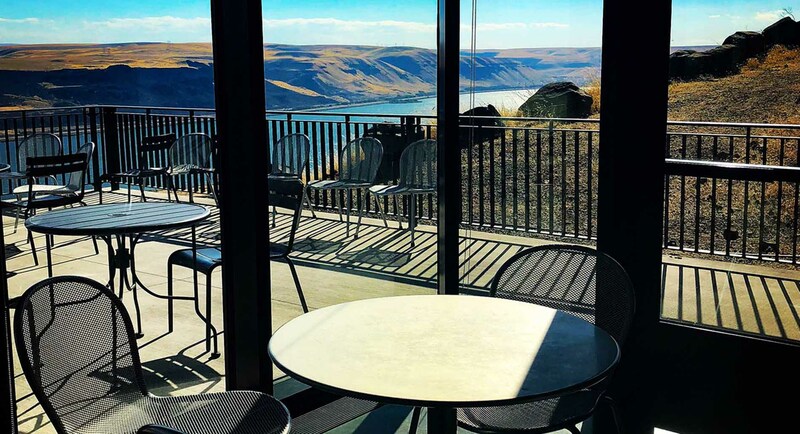 Loïe’s Cafe at Maryhill Museuam presents a stunning view of the Columbia Gorge where you can enjoy lunch and a glass of local wine, or simply sip a cup of coffee.